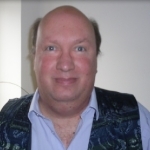 Welcome to the final Chatterbox weekly report. I hope you have enjoyed each week listening to the reports and learning about the behaviour of the birds that visit our gardens, school grounds, wetlands, farmland and coastlines here in the United Kingdom and don’t forget if you want to learn more about birds start following from next week on this website our new Bird Feeder Project. Remember, many species of birds in the United Kingdom do need our help all year round! It is sad to say but in less than 12 weeks summer will be over and some birds will be leave Britain in search of warmer weather and food. Migration occurs when birds travel long distances often from one continent to another in search of warmer weather and food. In Britain most migrating birds arrive in the spring and stay here until the late autumn…… but there are exceptions to this rule! Did you know that birds don't just migrate south for the winter! Take for example the Wigeon. These birds arrive in October for our warm winter - yes that's right our warm winter! So they haven't migrated from the South - they have flown from the North! In the spring they will breed in Iceland, Scandinavia and Russia, where they can find the right habitat to make a nest and look after chicks. But the weather there in the winter will be freezing - all of their food and grass, will be covered in snow and frozen solid. So the Wigeon, and many other ducks and geese, fly south to the UK and our warmer winters. The birds will find enough food and shelter to survive and then migrate north in the spring. In the UK we will also have many "garden birds" such as Robins, Blackbirds and Thrushes which arrive in the winter. These birds come from European countries that are too cold to provide food. Birds are great ways of seeing nature in action. Scientists are finding out that some birds, like the Chiffchaff, are starting to stay in the UK for the winter instead of migrating. This could be a sign of climate change - our warmer winters mean that there are enough insects for these insectivorous birds to stay all year round. One of the strangest facts about migration is that it would be more risky for a bird to stay in the wrong habitat than for it to travel thousands of miles. The journey might be full of danger but they are more likely to survive another year if they travel to a better habitat. The smallest bird to migrate across different countries is the Ruby-throated Hummingbird. It builds up its food until it weighs 6g (that the same as a 10p coin) and then flies 600 miles from North America to Central America! There is a lovely book called "Follow the Swallow" by Gruffalo author Julia Donaldson. The story is all about migration and features Apollo the Swallow and his friend Chack the Blackbird. Hopefully you might find it in your school or local library. BBC Migration Poster: Why is Britain a world migration hotspot? 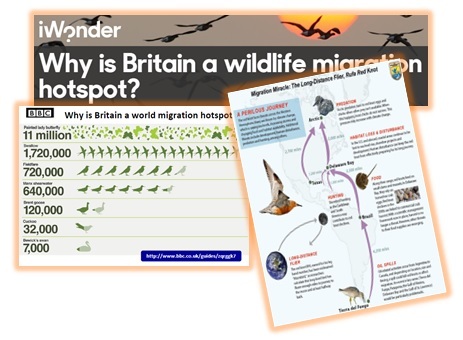 Website: BBC I wonder - Why is Britain a wildlife migration hotspot? Things to do and make!